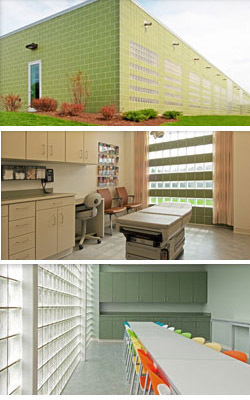 The Lombard Company is experienced in constructing medical facilities of all sizes and specialities. With quick turnaround capabilities and careful attention to detail, we ensure your medical facility is completed as scheduled and to your complete satisfaction. The Lombard Company would be happy to work with you as the general contractor on your next project and is certain you will be more than satisfied with the results. The Lombard Company was selected over other general contractors to build this important medical facility. Reasons for the selection included their competitive bid and their extensive experience constructing healthcare projects from medical clinics to entire hospitals. The 14, 315 square-foot, single story, low maintenance building has a modern, minimalist design. It is a load bearing structure, with glazed concrete block, glass block, structural steel framing and a ballasted EPDM roof. Bamboo wood panels and cast terrazzo floor tiles adorn the interior main entry/reception/waiting areas. The 1.74 acre site is fully landscaped and has on-site storm water detention. A 50-car parking area accommodates patients. 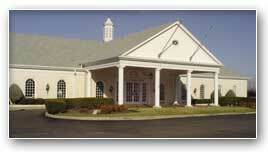 The building is a perfect fit for the neighborhood and complements well the Plainfield Road business corridor. The project involved The Lombard Company constructing a facility that would contain the world’s most powerful functional magnetic resonance imaging (MRI) magnet at UIC’s Center for Magnetic Resonance Research on the west campus. This included approximately 500 tons of steel, which was up to two feet thick, to encircle the magnet to confine stray magnetic fields that would disrupt the magnet’s function. To protect the magnet from street traffic and a nearby transit line, the steel was set on a separate foundation which rested on dozens of caissons sunk 40-50 feet below the ground. The Lombard Company constructed this surgery/lithotripter center for Dr. Thomas Evans. 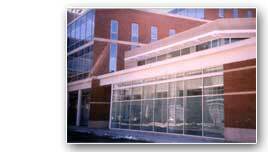 The Lombard Company has completed several projects for this highly respected hospital.